Big Island Rachel's Books: Book Review: "The Rabbi's Cat"
Book Review: "The Rabbi's Cat"
So it turns out that art schools have a pretty good selection of comics and graphic novels in their libraries. 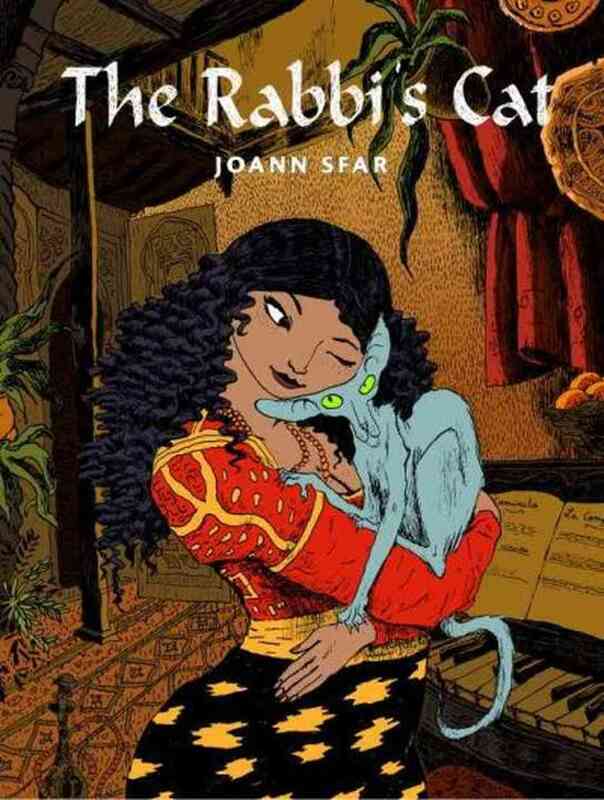 Today I'm reviewing "The Rabbi's Cat," an original graphic novel from French writer and artist Joann Sfar. "The Rabbi's Cat" was also made into a well-received animated movie that I haven't had a chance to see yet. Maybe the BF will let me put it on the Netflix queue--and maybe he'll finally return "The Seventh Seal" so we can start getting other DVDs in the mail again. You have had this since February and haven't watched it. Admit defeat and return it so we can get more cartoons. The story is told from the point of view of a cat owned by a prominent rabbi in 1920s French-colonized Algeria. Kitty is just an ordinary kitty until he eats the rabbi's parrot, at which point he becomes sentient and gains the ability to talk. To the consternation of his owner, the first thing Kitty says is a lie: "I didn't eat the parrot." So the rabbi tries to turn Kitty into a pious, Jewish kitty by teaching him the Talmud, even though Kitty wants to skip all that and go straight to learning the Kabbalah. This is a story about the Jewish experience, much like "To the Heart of the Storm" by Will Eisner. "The Rabbi's Cat" isn't actually about the rabbi's cat--it's about the rabbi and the people he has to teach and guide in his community, even when he isn't entirely sure where he's going himself. His world is in a constant state of change: modernization of clothing, morals and attitudes among his congregation; changes in French bureaucracy that could remove him from his post; his daughter is getting married to a Parisian Jew from an entirely secular family; and his cat has learned how to argue scripture with him. It's tricky to incorporate anthropomorphic animals into a story without it becoming childish or overly precious, and I think Sfar did a great job of making Kitty into a fully realized, adult(ish) character without losing the humor and whimsy that cats bring to the lives of their owners. Furthermore, Sfar seems to have a very specific reason for telling the story through the eyes of the cat instead of via one of the human characters. He uses the the outsider perspective of the animal narrator, who neither understands nor conforms to societal pressures and expectations, to great effect to illuminate the various states of separateness and alienation experienced by Algerian Jews both in their homeland and in the land of their colonial overlords. As a free agent, Kitty can observe and question human behavior in a way that the rabbi, who is bound by all the myriad rules of the Torah, has never done before. Final grade: B. Recommended for fans of cats and those interested in the Jewish experience and life under French colonial rule.